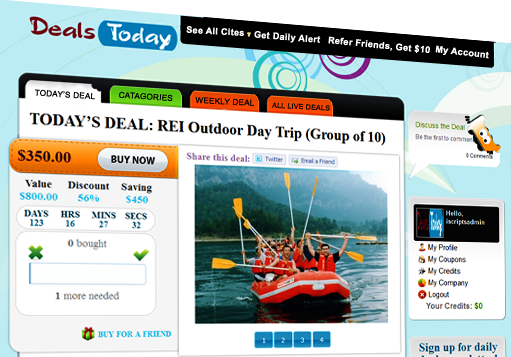 iScripts DailyDeals is the most trusted software for starting your own group buying site. This platform harnesses social buying and creates a stand-alone solution for full site control by the administrator. Installation is simple and fast and the suite of tools included allows you to focus on running your new business. Similarly to Groupon.com, you can list special offers for products and services from a selection of vendors. The site administrator receives a commission for the products sold via the group discount website. With the integrated payment processing system, the administrator will receive all of the payments. Vendors will then receive a list of the products that have sold through your group buying site. Our software package includes a full toolset including editable email templates, customizable offer pages, an intuitive user interface, and a robust administration panel. Host the platform on a popular hosting plan of your choice, allow the installation wizard to complete and start your new daily deal site now! The software is open source and is not encrypted so you can modify it at any point in time. iScripts can also modify or customize your group discount buying site so that you are sure it is tailored to your business’ needs. You can request a quote from our skilled development team at iScripts. iScripts DailyDeals is the most trusted software for starting your own group buying site. This platform harnesses social buying and creates a stand-alone solution for full site control by the administrator. Installation is simple and fast and the suite of tools included allows you to focus on running your new business. After you purchase the group buying script, customize the software by adding a logo, your site content, and the special products. You can accomplish this in just a few clicks. Be sure to list products that are in line with your site's theme and maintain an interest in your target market. Whether you are creating a new group buying site or adding the software to your existing website, offers the features and functionality for a successful online group buying website. iScriptsDailyDeals offers the same great features available on Groupon, Living Social, and other daily deals sites. Create a group buying site complete with features all built right into your site. Organize your campaigns from different vendors and various coupons or offers. Setup different plans with a range of services including free and paid plans. Use the analytics suite to track all of your data and measure your success as you grow your site. Create a group buying site of your own. The popularity of social buying sites proves how quickly you can attract users on a national or local scale. Our simple-to-use platform can be used to attract even more traffic to your existing site or to further monetize your client list. Scripts DailyDeals allows you to advertise various products at a discounted rate catered towards your audience. After you purchase the script, you will have complete control over your group discount site. iScripts DailyDeals allows you to partner with businesses in order to sell their products and services at a discounted rate and make a profit. There are many options that you can choose when starting your group buying website. You can create a targeted site that sells spa or vacation packages. You can even create a site marketed towards parents and have discounts for children's necessities. Find an area that you have knowledge about and are interested in to create a specialized group buying website. "Great script and great features. Now I have a huge customer base. Hope your support continues.."
"Thank you for the support during issues. My business is doing real fine. Thank you again"
"Great software and great support. Thank you!!!"